The following is The Wife's email reply to neighborhood activist John O'Grady, who asked her about the main issues surrounding the Rapp Road Dump. Thank you very much for emailing! There is nothing I like better to do, than trash talking! 3) As far as I can tell, no records are kept on where the other 80% of the garbage comes from. 4) This proposed expansion is the 4th expansion of the landfill in the Pine Bush. The original landfill was opened in 1969, the first expansion (which we fought vigorously) was completed around 1991, the second expansion filled in between the landfill and the 1991 expansion and was granted in the mid-1990s. The third expansion (which Save the Pine Bush sued over and lost on lateness) was granted in 2000 and was to last until 2015. 5) This proposed expansion, the capital costs ALONE will be $41 million, and the expansion is proposed to last a measly five years. The bonds for the last landfill aren't even paid for yet! 6) After the City gets another permit to expand the landfill in the Pine Bush, they PROMISE NEVER to expand again in the Pine Bush! Please see my comments/responses below. My City Council representative Mike O'Brien plans to comment favorably on the landfill expansion at the hearing on 12/3, and has asked me to support it as well. Would you mind clearing up a few points? I will be glad to help. Mike says that the expansion will restore the Fox Run Trailer Park into native habitat, and that by doing so the Pine Bush Preserve will be able to reconnect pine barrens to the west with areas to the east. First, when the last landfill expansion was approved in 2000 (over Save the Pine Bush's vigorous objections and lawsuit). the City was REQUIRED by the DEC landfill permit to purchase Fox Run and dedicate it to the Preserve. Dedication is important, because that gives the land protection from development. The City purchased Fox Run right away in 2000, after the approval for the landfill expansion was given. However, the City just did not get around to dedicating it. In 2005, Jerry Jennings proposed to expand the landfill into Fox Run. In January, 2006, Save the Pine Bush filed a lawsuit to force the City to dedicate Fox Run to the Preserve, the next day, Jerry Jenning announced a different location to expand the landfill. The only reason Fox Run is not a landfill today is because of Save the Pine Bush's lawsuit. This is the history of Fox Run. Please note that Mr. O'Brien has been on the Council since 2001. The bone the City wants to toss to the environmentalists is that once this expansion is approved, is the promise the City will have the landfill and Fox Run restored to Pine Bush. Lets talk about Fox Run first. Fox Run is about 80 acres in size. The trailers took up about 20 acres, the rest is undeveloped. I am sure the Albany Pine Bush Preserve Commission over the coming years, can easily restore Fox Run to Pine Bush ecosystem, without a lot of cost or hassle. The Commission can remove the invasive species, and plant and encourage native species. They do this all the time, no problem. Now, the City is proposing to spent $12.5 million (or $18 million, depends on who is talking) to restore the landfill itself to Pine Bush. To me, this is obscene. Can you imagine what $12.5 million would do for my neighborhood, the South End? You could probably fix every vacant building for that amount! With the poverty, gun violence, deteriorated houses, the city wants to spend $12.5 million to make the landfill into Pine Bush again. Of course, there is the question: is it technically possible to restore the landfill to Pine Bush ecosystem? Dr. George Robinson, who works at SUNYA in the biology department, has been involved in restoring landfills, by putting topsoil on top the the landfill and persuading plants to grow, thus attracting animals. So, yes, it may be possible. The landfills Dr. Robinson has been involved in restoring, were not in a pine barrens ecosystem. The only way I can see that restoring the landfill is even possible is by bringing in enough sand to cover the entire landfill to 4 feet deep. That is a lot of sand! And, the expense. The expense, in light of the City's problems these days, is obscene. I've ridden my bike from the Preserve trails into the trailer park on occasion, and it seems to be in a woodsy location already. The expansion plan would require everyone to move? When the last expansion was approved in 2000, and the City bought Fox Run, the residents were given an option of the City buying them out at the time or staying at Fox Run until 2015. There were about 100 trailers in 2000, about 90 of the trailer owners left in 2000, there are about 10 trailers remaining. The remaining 10 would need to leave in 2015. Also, while I definitely like the idea of connecting the trails east of the Discovery Center with those west of Five Mile Waterworks, I don't see how expanding the landfill will accomplish this. I agree with your logic. 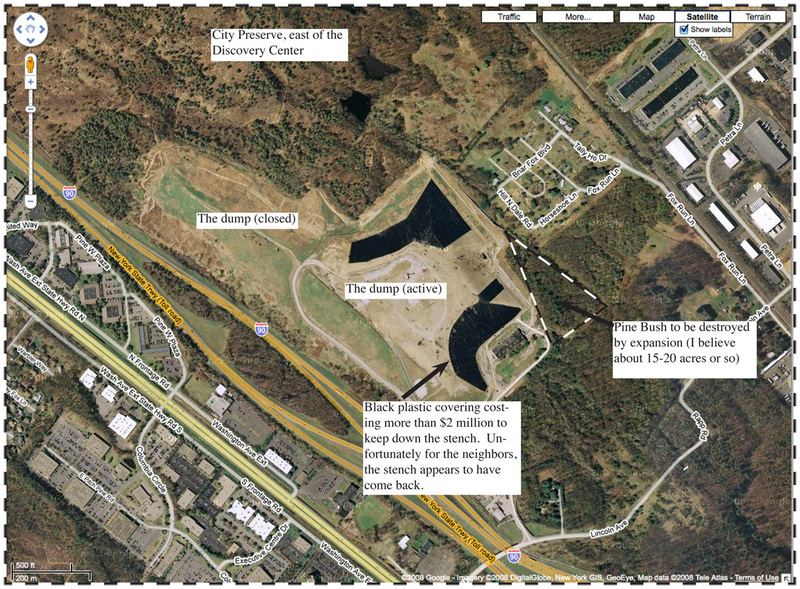 Better not to expand the landfill, if the goal is to connect Lake Rensselaer to the City Preserve, east of the Discovery Center. Mr. Applefbaum actually said at a Save the Pine Bush dinner that it was BETTER for this 20 acres of Pine Bush to be made into a LANDFILL first, and then afterwards, to RESTORE the land back to Pine Bush ecosystem!!! This is the City's restoration consultant saying this! Have you ever heard of such idiocy? Save the Pine Bush believes the 20 acres should be left as Pine Bush. Another point offered in favor of the plan is that it would include money for habitat restoration in the Preserve. Mike expands upon this by saying that the landfill itself will be part of the restoration. Is that true? Yes, this is true. See comments about restoration of the landfill above. Finally there's the too-big-to-fail argument, i.e., the mistakes of a lot of people in the past were so big that we have no choice but to mop up after them now. Does this apply in this case? Will we be shipping trash to Seneca County in 2010 if we don't approve this expansion now? The current landfill expansion was supposed to last until 2015. Now, the City says it will be totally filled up in 2009, or 40% earlier than expected (the original was to last 15 years, but it appears it will only last 9 years). The question is: why? The Honorable Dominick Calsolaro (Ward 1, my Common Council representative) has been asking questions about the landfill for years. Every year, he raised questions about the landfill in the budget. In my humble opinion, the problem with the garbage, is that it is big business. For example, Allied Waste had a contract with the City to dump garbage for $37 a ton, while our ANSWERS partners were charges $52 and anyone else was charged $70 a ton. After that was exposed in an article written by Brian Nearing of the Times Union (see http://www.savethepinebush.org/News/06DecJan/Garbage.html for analysis of the article). NY State is in the process of reviewing and updating its solid waste management plan. Though it does not say it is plain language, reading the plan, you realize that NYS is advocating for zero waste. Not possible you say? I went to this excellent conference on zero waste a couple of Saturdays ago. It was excellent, and described the multi-pronged approach needed for zero waste. Zero waste won't happen this year, but, if we begin to take the steps needed, I believe it is a reasonable goal in 20 years. To me, there is something really fishy about the landfill. Depending on who you talk to, you get different estimates on how much income the landfill provides. But, it is not really possible to get information on the exact amount of income the City receives from the landfill because the Treasurer, Betty Barnette, won't give the Controller, Tom Nitido the information he needs. So, I just don't know. I have heard rumors that garbage haulers routinely skip out on paying their bills, then, go out of business so the money cannot be collected by the City, and go back into business with a different name. I have heard rumors that the City is owed millions by these garbage haulers. Who knows? I certainly don't! It would also be helpful to me to have an idea how big 13 acres is. What percentage is that of the acreage bounded by (in a clockwise direction) New Karner Road, the railroad tracks, Rapp Road, and the Thruway? Oh, this is a hard question! I do not know how to describe 13 acres at all for you. Those were a lot of questions - I will certainly understand if you've got more pressing things to do. Nothing is more pressing that talkin' trash!! !